Finding the right contractor with ADA knowledge and experience can be as much of a challenge as maintaining your independence throughout an accessible wheelchair design in Austin. You should be looking for a contractor who understands life changes. A contractor who offers specialty products and services standing out from the rest of the pack. A contractor who has the ability, through experience, to help clear the murky water impeding your accessible route and how it can be accomplished. One who takes ADA remodeling to another level promoting safety. A well versed construction professional can take on and solve any residential ADA challenge creating an accessible design. These can include widening doorways, ADA compliant kitchen cabinets, or ADA compatible baths. Door widening is a common problem especially where wheelchair access is a must. All doors should be 36" wide with the correct locking hardware installed. The rule is 32" clear within the accessible route but 32" doors don't give enough clearance because of their stops. You also need to pay attention to which side the lockset is installed on to not limit any wheelchair access or operation of the door's locking hardware. 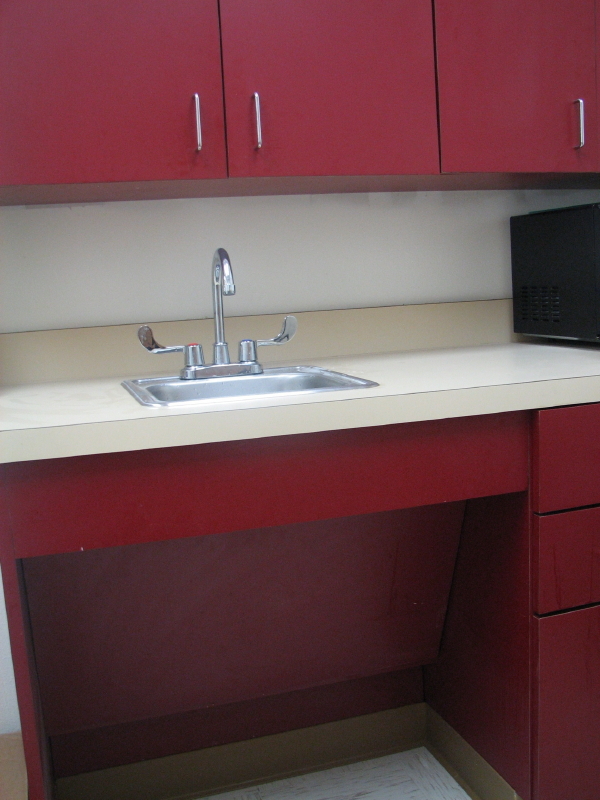 ADA compliant kitchen cabinets give you the ability to freely roll under the correct depth sink with covered or insulated water and drain lines. The sink should be equipped with a proper automatic or wrist handle faucet. A finished cabinet top height of 34" will also be observed. Wall cabinets should be mounted around 4" lower than usual for reachability from a sitting position. An unobstructed five feet turning radius on the floor should also be maintained. Bathroom transformations complying with ADA revisions also require the same turning radius noted in the kitchen along with a correct bathing facility. If a tub is useful, correctly placed grab bars must be installed for safety reasons. Showers can be either the roll in or transfer type dictated by the individual user's physical abilities. The comfort height toilet should have grab bars installed at 34" on the side wall as well as at the rear at a minimum. The flush handle should be oriented toward the middle of the room away from the side wall. The bathroom sink should be accessible as in the kitchen mentioned above. Traditional home builders and remodelers don't really consider the needs of the disabled or elderly like ADA vanities or roll in showers which are universal in nature. It takes a special breed of contractor to realize special needs for special people. A revolution in building design standards is long overdue. Our current building design standards do not address the needs of more than one third of our existing population. Many more people can greatly benefit from accessible design versus conventional design. Our rapidly aging population is experiencing the limitations of our personal living environments. Any evolution in building practically always begins in the common areas of the commercial building sector. The American Disabilities Act of 1990 increased the attention needed for those people having the right to equally access their work place and any recreational or leisure facilities. These rules at least offer minimal solutions for those needing the most help with any building access. In Austin, we now must provide access to one bathroom on the first floor in new homes as deemed by our newly adopted building regulations. This basic right to a handicap accessible bathroom is finally being enforced by the city's building inspectors. What a tremendous needed and basic design improvement! Aging in place construction and Austin ADA remodeling has become synonymous with handicap accessible home design and modification during our lifetime. Home modifications can be used to accommodate anyone from people with mobility impairments to those with vision loss, hearing loss, or even cognitive or developmental disabilities. Accessibility home modifications or wheelchair accessible kitchen and bathroom remodeling in Austin will allow anyone with limited mobility within your home to feel more empowered and independent. The extent of a customized accessibility design is dependent upon the activity level of the person requiring the modifications. We offer barrier free accessibility for the home or office.